Sherif Selim is a dedicated and diligent surgeon serving the community of Takoma Park, MD. 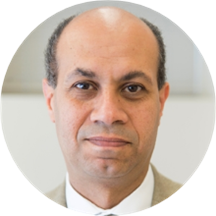 Dr. Selim attended the Cairo University Faculty of Medicine, where he received his medical degree, and completed his residency in general surgery at George Washington University. Dr. Selim is a part of AMG Surgical Specialists. He is board certified by the American Board of Surgery. He is also a member of The Royal College of Surgeons of England. Because he is bilingual in English and Arabic, patients from a variety of backgrounds enjoy having him as their physician.Outside of his practice, he enjoys playing tennis. Dr. Selim is dedicated to helping patients receive the treatment they need so they can enjoy a positive and fulfilling lifestyle. He treats a range of conditions, and he is eager to help the wider community receive the care they deserve.